Start with 95 acres of wooded ravines, winding trails, natural springs, wetlands, and a dramatic stretch of the White River. 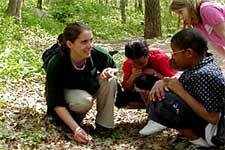 Add an innovative Nature Center staffed by experienced environmental educators and outdoor leaders. Combine these elements with dedicated school teachers and excited students and you have created the dynamic educational opportunity found only at Holliday Park. 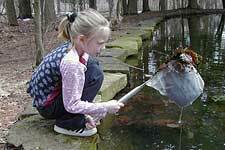 These hour-long field trips have been designed to complement the Indiana Academic Standards for Science 2010. Available for pre-K through 6th grade, these new field trip options help students realize the wonders of nature first-hand. 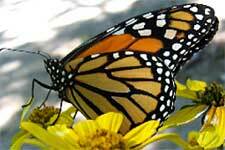 These programs offer older students the opportunity to experience several topics and habitats at Holliday Park in one visit. Two-hour extended field trips are available for 2nd and 3rd graders. For 4th through 6th grade students, the Outdoor Ecology extended field trip explored multiple habitats in a three-hour program, plus time for lunch. The plants and animals of Holliday Park change dramatically throughout the year. Seasonal hour-long programs highlight the uniqueness of each season and are available for all grades. They are great for classes looking for multiple field trips that offer new learning opportunities each visit. If you are looking for a way to tie the on-site experience at Holliday Park back to the classroom, Classroom Connections can help! During these 45-minute programs, a naturalist will visit your classroom with live animals, hands-on nature props and an interactive lesson. Perfect for a pre-trip or a post-trip experience, these visits help students connect the learning during a field trip with classroom lessons. For grade specific details on all of our field trip options, check out our Environmental Education Brochure. Groups are invited to bring picnic lunches before or after programs. Lunch facilities are only available outside. Please advise nature center staff at the time of scheduling if this is planned. Year Round Field Trips: On-site, hour-long field trips are $5/student with a $50 minimum. Parents and chaperones are free with a suggested adult-to-child ratio of 1:8. Programs are limited to 60 students/hour. Larger groups can be accommodated, please call for details. Extended Field Trips: Programs are $5/student for the first hour, and then $1/student for each additional hour of programming. Classroom Connections: Outreach programs are 45 minutes long and are $35/class. Outreach programs that are scheduled without an on-site field trip are $75/class. Schools with a minimum of 40% of students receiving free or reduced lunches are eligible for discounted field-trip fees. Payment is expected in full on the day of the program. 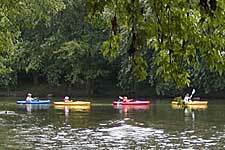 Cash, credit, and checks made payable to Indy Parks are accepted. All programs will be conducted outdoors rain or shine. Students must dress appropriately for the weather. If severe weather arises during the students’ visit they will be moved indoors. If it arises prior to the students’ arrival nature center staff will contact groups and reschedule if possible.